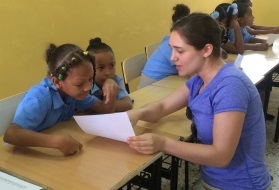 Located in the Los Tres Brazos barrio 25 minutes outside of the capital, Santo Domingo, the Bernardine Franciscan Sisters have a mission el Centro Misionero Catolico Hermanas Franciscanas Bernardinas. Along with their volunteers, the Sisters have been making an impact to the community by providing services and resources for over 20 years. Volunteers work alongside the Sisters in the school, teaching elementary grade school students or adults in various subjects: ESL, music, arts and crafts, cooking, physical education and computer skills. In the clinic, the volunteers work with the general doctor or in the pharmacy. Volunteers will have many opportunities to interact with the community. Requirement: A competence in Spanish is required. The long-term placement is 3 months. The short-term placement is from one week to three months.